A potentially groundbreaking device which many scientists have called ‘impossible’ might very well be real. 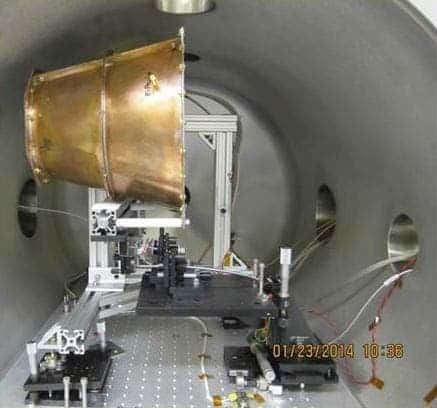 Prototype EmDrive built at NASA Eagleworks laboratory. Everything started with British scientist Roger Shawyer, who presented his EmDrive microwave thruster as an alternative to powering spacecraft without propellant – a very powerful and efficient method. Instead of fuel, it uses microwaves bouncing off a carefully tuned set of reflectors to achieve small amounts of force and therefore achieve propellant-free thrust. Designs for a device called a “microwave thruster” were first proposed in 2006. It created quite the stir around it and while the device was physically sound and followed the principles of relativity, it was dismissed by researchers who claimed that such a functioning device would defy the law of conservation of momentum. This claim was quite simple: if you want to propel a shuttle forward, you have to push something else backwards, so how could this propeller work without pushing anything away? Well, NASA wanted to see if it works, so they built one. Much to the surprise of some physicists – it worked. Furthermore, NASA isn’t the only one building an EmDrive. In 2008, Chinese researchers confirmed that they are building the “impossible” space drive, hoping to revolutionize space travel. But people still weren’t convinced. Some researchers argued that there must be something we’re missing, some kind of error in understanding how this drive works. So of course, NASA said it will take its project into outer space, free from any earthly interference. But in the meantime, it had another thing to do. NASA then wanted to confirm its results, so they sent out their experiments for peer review and publishing. In peer reviewal, highly qualified individuals review the paper and identify any potential error or lack of accuracy. Well again, the EmDrive passed with flying colors. No one could find a flaw in the experiment. The new peer-reviewed paper is called “Measurement of Impulsive Thrust from a Closed Radio-Frequency Cavity in Vacuum“, and has been published online as an open access ‘article in advance’ in the American Institute of Aeronautics and Astronautics (AIAA)’s Journal of Propulsion and Power. It’s set for print publishing in December. That’s not super impressive when you consider that the super-powerful Hall thruster generates force of 60 millinewtons per kilowatt, but this was a proof of concept more than a functional device. Pilot-wave is truly a bizarre theory. It’s so strange that when a 1992 study tried to discuss it, it concluded that a particle following its laws would end up taking a trajectory that was so unphysical — even by the warped standards of quantum theory — that it can only be described as “surreal”. It’s basically a complicated and convoluted way of interpreting quantum mechanics. The approach was first proposed by Louis de Broglie in 1927 and subsequently adapted to modern physics. It does a really great job at getting rid of some of the paradoxes in conventional quantum mechanics (the Copenhagen interpretation). You don’t have to deal with things like wave–particle duality, instantaneous wave function collapse and the paradox of Schrödinger’s cat. But you have to deal with other things, which are just as weird if not weirder. The trajectory of any one particle depends on what all the other particles described by the same wave function are doing, without any geographical limits. So one or several particles could, in theory, span the entire universe. This means that all the particles in the universe are interdependent in ways that are hard to gauge. Very few physicists follow this approach and it’s easy to understand why, but recent experiments have offered it increasing validity. It could be the case that this EmDrive is what tips the balance even more in the favor of pilot-wave. Of course, this is still one hypothesis, and many physicists still aren’t convinced. This is the first peer-reviewed article about the EmDrive, and we’ll have to wait and see how the scientific community reacts to it. In the meantime, NASA is preparing to test the EmDrive in space. If it works, we may have to rewrite some physics books.